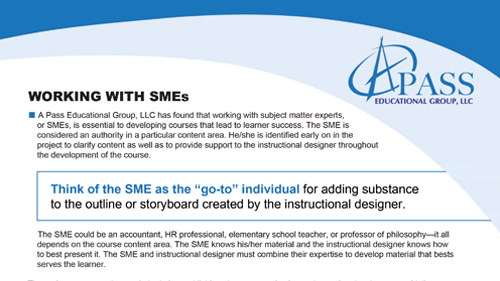 Instructional designers partner with these organizations to create customized instruction that leads to desired learning outcomes. 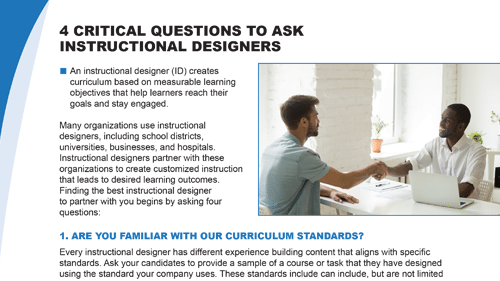 Finding the best instructional designer begins by asking four questions – Download this brief to learn more! We have found that working with subject matter experts (SMEs) is essential to developing courses that lead to learner success. Download this article to learn five best practices that we incorporate into our partnerships with SMEs. A Pass has created assessments for several of our state history programs. Each project has been on time and on budget. During the course of a project, I communicate regularly with the A Pass team to address any questions or concerns they or I have. Any problems that arise have been addressed immediately and effectively.